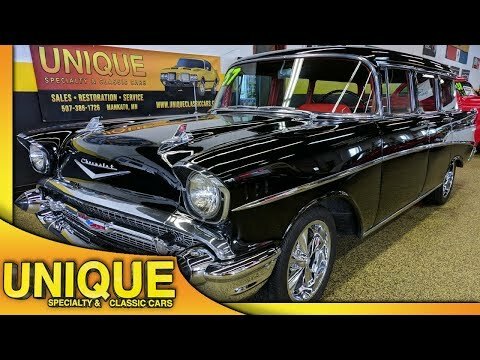 1957 Chevrolet 210 Wagon, turns heads, runs great! TRADES? 1957 Chevrolet 210 Wagon that came out of Arizona. This is a 210 model with the Bel-Air trim package added. Chrome and bright-work are in great shape. Under the hood is a 283 paired with a freshly rebuilt automatic transmission. The paint has a nice luster to it with a little bit of patina in a few spots as well. This is a very solid example of a 210 Wagon. Other than the custom wheels and the aluminum radiator, the car is pretty much stock. Red and black two-tone interior in great shape. Door cards, carpet, and headliner are all in great shape. Automatic shifter on the column. Just a great running and driving classic Chevy wagon.